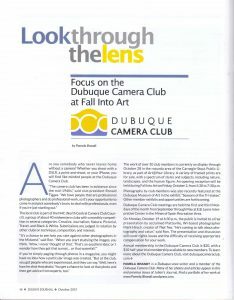 Click to view the Dubuque Camera Club brochure (updated September 2018). 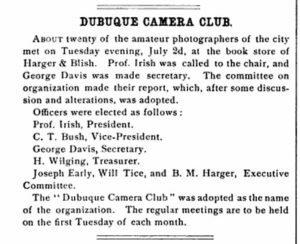 The Dubuque Camera Club dates back to 1899. 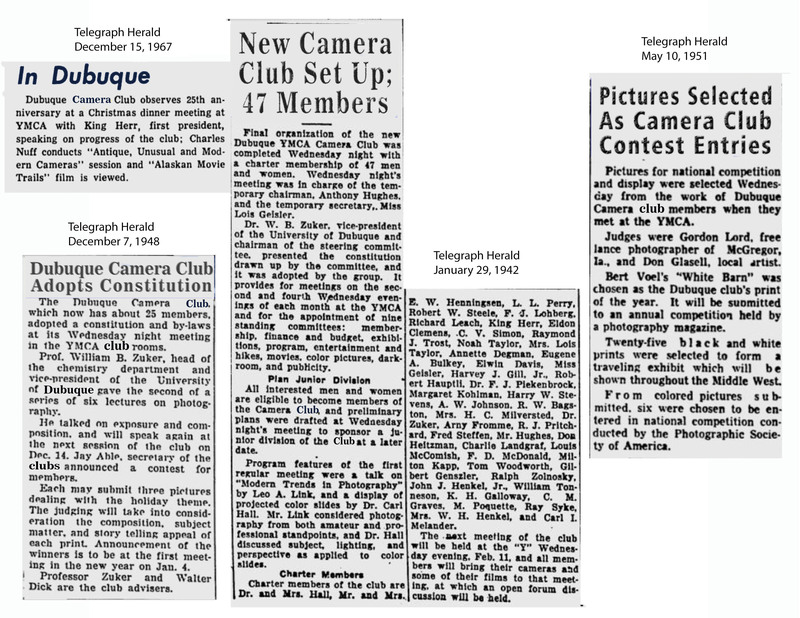 This clipping was taken from The Photographic Times and American Photographer, vol. XIX, W.I. Lincoln Adams, editor. New York: The Photographic Times Publishing Association, 1899. (p.360). Download the complete issue here. 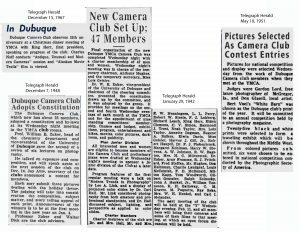 These articles about the Dubuque Camera Club appeared in the Dubuque Telegraph Herald from 1942 to 1967. 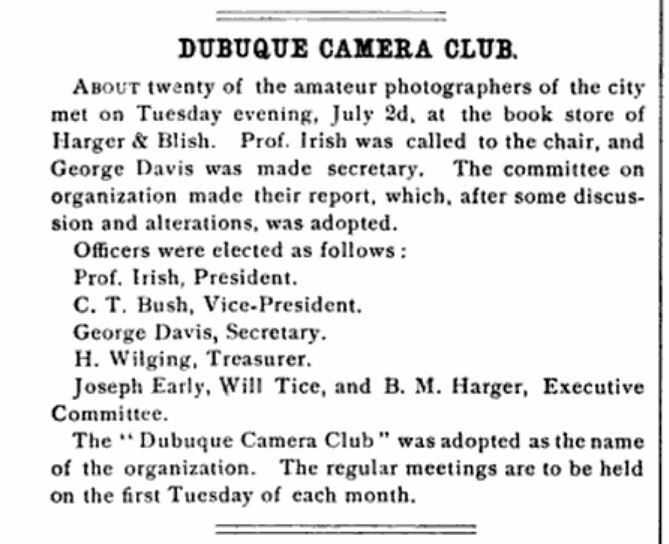 The modern logo of the Dubuque Camera Club consists of the stylized shape of a camera with DCC, the club initials, in the center. The blue area represents the Mississippi River. The yellow-gold represents sunrise on the blufftops. The curve at the top repeats the curve of the iconic Julien Dubuque bridge. This logo was designed in 2013 by club member and photographer Nate Roling. 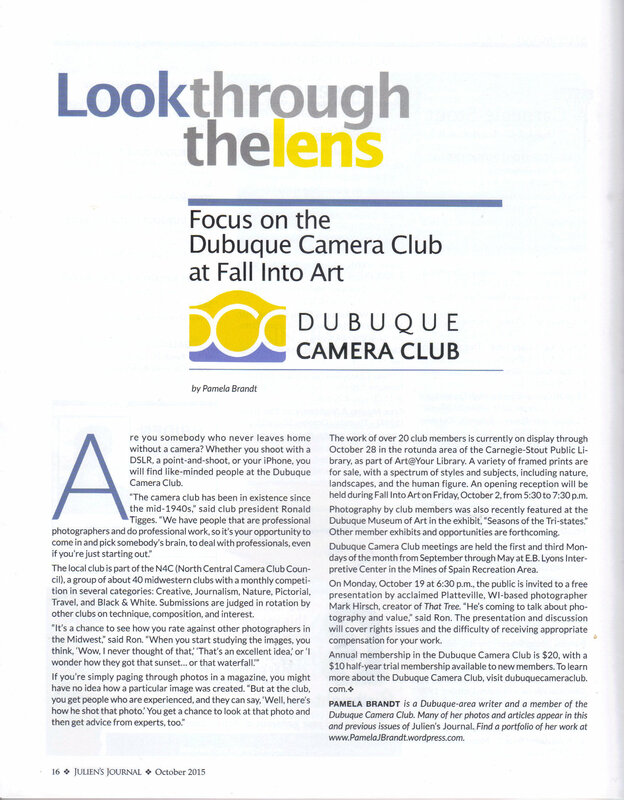 In conjunction with an exhibit at the Carnegie-Stout Public Library, the Dubuque Camera Club was the subject of a feature by Pamela Brandt in the October 2015 issue of Julien’s Journal. Click on the image to read the story.